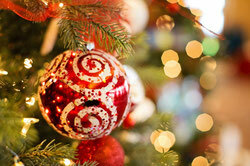 Come enjoy Christmas in Whistler at the wonderful Westin Resort & Spa! Come say hello and sing with with us! Robson Square Performance open to all! Everyone is welcome! So don your winter apparel, throw some skates on and join us at Robson Square in Vancouver on December 15th. The Agency is back at Sinclair Centre in the heart of Vancouver to serenade you while you shop! Come see us on Dec. 7th an dagain on the 20th to hear your favorite holiday songs. Catch The Agency singing live on CTV this Friday Dec. 22nd. The girls are singing classic Christmas carols throughout the show then giving an interview and singing their own original song, "We all want Santa". Once again The Agency is donating 100% of the proceeds from the sale of "We All Want Santa" to BC Children's Hospital. Click the link here if you would like to buy/donate too. Merry Christmas to all! There's a Speakeasy happening at Hycroft Manor and these three canaries may or may not be partakin' in the fancy shmancy gig. If you a coppa they ain't, but if you know ya onions, they is! The Agency is thrilled to be a part of the 6th Annual Gala in support of the Kidney Foundation of Canada. 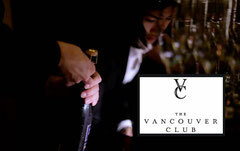 This years Gala will take place on March 8th from 6:30-10pm at The Fairmont Hotel Vancouver. Entertainment is a cinch with us as your gals. From Speakeasies to Hollywood Glamour bring us in and enjoy! Go on hoof it up! Speakeasy's are the bees knees. No cancelled stamps here, just giggle water and Oliver Twists!! 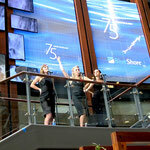 Congratulations to BlueShore Financial for 75 years of going "Beyond Banking". Thank you for having us help you celebrate! You put on quite a party for your valued patrons. The Agency is proud to be apart of this wonderful charity event for the fourth year in a row. An evening of great music and food all geared toward raising awareness and much needed funds to conquer oral cancer. For more information visit... Taste for Life! The canaries of The Agency are whoopin' is up Sunday, April 3rd at The Commodore Ball Room for the SIR Foundation Gala. Shhhhhh... it's a Speakeasy... no giggle juice or hoofin' allowed! The City of Burnaby has hired The Agency to perform on March 30th at the Bonsor Complex in Burnaby as a special "Thank-you" to their volunteers for all that they do. It's wonderful to volunteer, it's even more wonderful to for us to get to say thank you back! ..."It's the most wonderful time of the year"
On October 3rd the girls donned their flappers dresses and join the Engagement Unlimited cast for a special Speakeasy performance at the Crystal Gardens in Victoria, B.C. It was a fun night of hoofing and whoopee! Mark your calendar for July 9th. 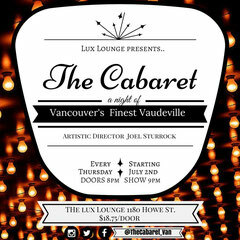 The Agency will be performing at the fabulous Lux Lounge in Vancouver. The girls will be a part of a Cabaret Night produced by the oh so talented Joel Sturrock! Come on out, we would love to see you!! In the past three years "An Evening to Conquer Oral Cancer” has raised over $215,000 for the BC Cancer Foundation in support of the BC Oral Cancer Prevention Program at the BC Cancer Agency. Champagne, caviar, signature cocktails and The Agency will all be found at the elegant Vancouver Club for a fabulous New Year's Eve party on December 31st. This black tie event runs from 8:00pm until 2:00am and is available to members and guests. For info on becoming a member of this exclusive club, click here... The Vancouver Club. 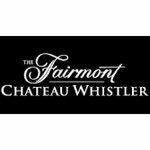 The Fairmont Chateau Whistler has once again invited the girls back for another year to sing holiday classics over Christmas. All through the 23rd to 25th you'll hear The Agency's voices harmonizing in the beautiful and grand Hotel. All are welcome to come and enjoy! We are happy to announce that for the 2014 Christmas season 100% of the proceeds from all sales of our new single "We All Want Santa" will be donated to the Canadian Feed The Children charity. Our new Christmas song is ready to be released! We're super excited and hope you are too. To hear the new song, use the CD Baby player below. It's always fun to record new music and today we were treated to the sweet sounds of Chris Davis playing trumpet on our new Christmas song. If you haven't heard Chris play, check him out on itunes... Chris Davis Trumpet Or, you can wait 'till Christmas when the new song is set to come out! 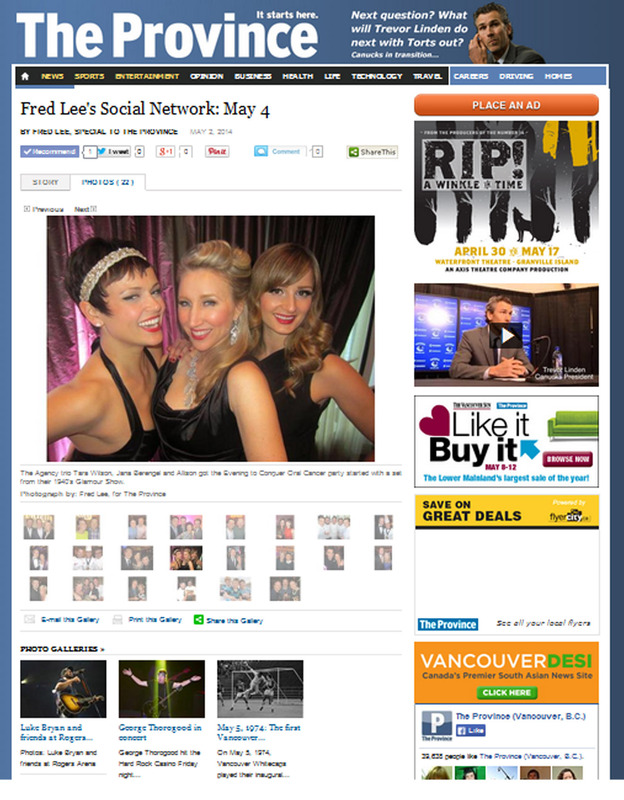 Check out this week's Province Newspaper to see the smiling faces of The Agency in Fred Lee's Social Network section. 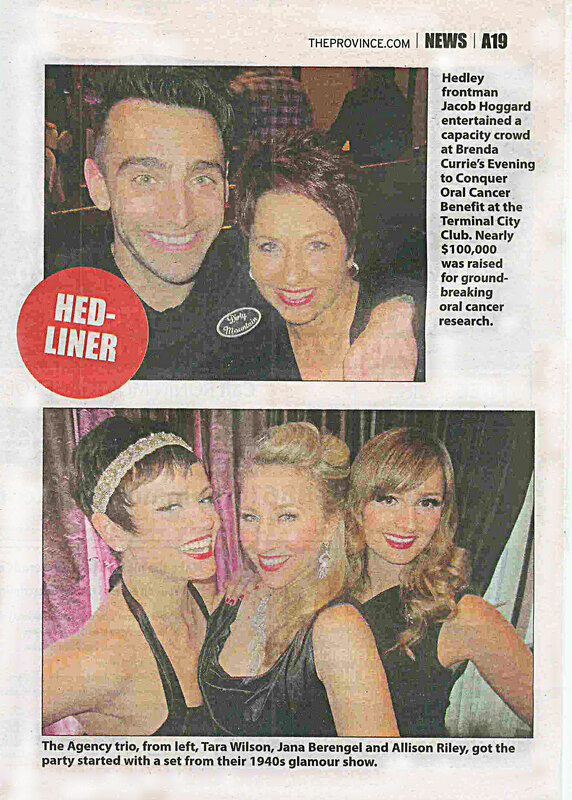 The article talks about the success of the recent Evening to Conqour Oral Cancer Benefit with nearly $100,000 raised for the charity. Hosted by CTV's Norma Reid, a great night was had by all and The Agency got the party started with a set from their 1940s glamour show. Thank you Fred Lee! 3rd annual "An Evening to Conquer Oral Cancer"
Video from last year's event. The beautiful Fairmont Chateau Whistler has invited the girls back to sing classic Christmas songs. From December 23rd to the 25th you'll once again hear The Agency's warm sound fill this grand hotel. All are welcome to come and enjoy! This year The Agency will once again be joining the cast of Tony Barton's Christmas show "Jingle". A fun, family friendly holiday concert featuring a 23 piece orchestra, classic Christmas songs, Santa and even a snowball fight! The Agency will be helping to celebrate Christmas this year at Canada Place. Singing classic Christmas songs in their classic harmony style. The girls will be on stage and on the floor grounds caroling to your hearts content! 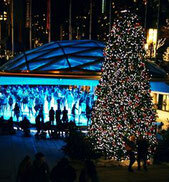 Christmas at Canada Place is free, family fun and part of the Winter Waterfront District. The Ascenta Foundation for Health & Education Outreach. The Ascenta Foundation is a Canadian-based charity that promotes health and well-being to impoverished countries. The foundation provides individuals with urgent medical, dental, optometric and surgical services through three to five day long health missions. Last year's event helped raise $35,000 for the Foundation's February, 2013 medical mission to Riscos de Oro, Nicaragua, where over 2,200 people were treated during the four day clinic. This year, the Ascenta Foundation would like to invite you to a Speakeasy! Come out and enjoy this fabulous event and support a great cause! Show your love for mental health and people living with HIV/AIDS by taking part in the second annual brilliant! fundraiser for St. Paul’s Hospital. The Agency is performing in this fundrasing fashion extravaganza with models representing Canada’s hottest fashions, hair stylists, makeup artists as well as live music, silent/live auctions and dancing. Over $300,000 was raised from the Brilliant! fundraiser. All going to for patients at St. Paul’s Hospital with mental health issues & HIV/AIDS! Thank you so much for your support. Charity Event "Fight for What's Right"
The Agency is performing in and supporting the "FIGHT FOR WHAT'S RIGHT" charity event on Friday, July 12th at 7pm at The Croatian Cultural Centre in Vancouver. Inspired by a nonprofit organization out of South Africa, who hope to raise $20,000 to build a drone that will patrol the Pilanedburg Reserve in hopes to locate and arrest poachers. Poaching is such a serious issue that there are sadly only 37 White Rhino's left in South Africa. All Proceeds Go To The Aerial Conservation Drone Project (The Rhino Drone Project). Save the Rhinos and let's Track These Poachers! We are happy to announce that our very own Jennifer Copping has been nominated for a Best Actress Leo Award for her role in the critically acclaimed movie "Becoming Redwood". Winners will be announced on Friday, June 7th at The Westin Bayshore. Good luck Jennifer! Congratulations Jennifer on your Leo win!! We are so proud of you!! Thank you Malcolm Parry for featuring The Agency in The Vancouver Sun! The photo and article are in the front page section of the paper (A5) or click on The Agency in The Sun to see the link. Guest Spot with Tony Barton's Show "JINGLE"
The girls of The Agency will join Tony Barton's Christmas show "JINGLE" on Saturday December 15th at the Genesis Theatre​​​ in Ladner, BC. Lead by the vocal stylings of crooner Tony Barton and the Blue Heron orchestra, "JINGLE" is an interactive and jolly Christmas show with recognizable holiday tunes sure to get you and the whole family into the spirit of Christmas. The Agency is performing their Classic Hollywood Show at this year's Surrey Fest on June 16th. With music and entertainment lined up for the whole day, come on out to the main stage at Central City Plaza (13450-102nd Ave in Surrey) and celebrate this vibrant community! Visit the Surrey Fest website for more details... Surrey Fest. 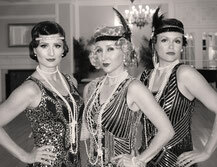 The Agency is performing their Classic Hollywood Show for a VIP event on April 21st at Vancouver's Sheraton Wall Centre. The night is set to be a Chicago-style Speakeasy and the girls have been given all the secret knocks. Word on the street is, the prohibition on blahzay parties is officially over... now that The Agency is here! The Agency will perform a guest spot with the fabulous jazz band The Hot Foot Five on Thursday January 12th at The Kozmik Zoo (53 West Broadway, Van). The girls will sing numbers from their Classic Hollywood Show and jam into the night with the amazing Hot Foot Five. Come on out and enjoy! 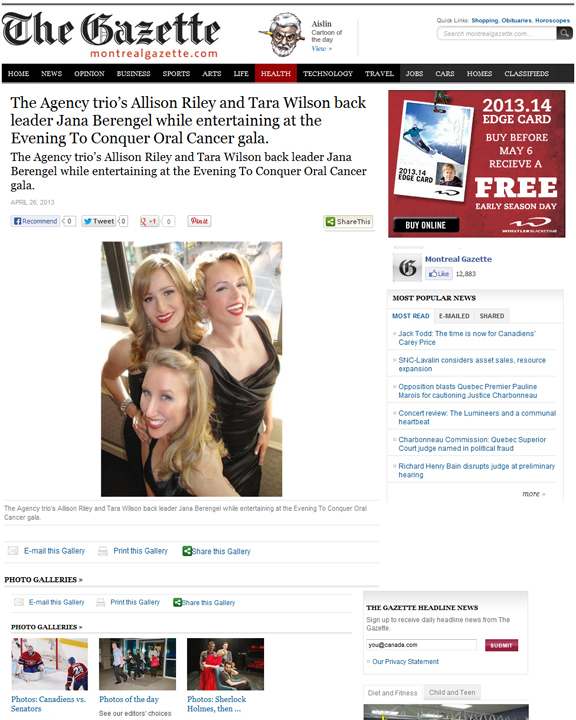 The Agency will be singing live on CTV Morning Live this Monday morning! All through the 8am hour the girls will warm up Vancouver with classic Christmas songs in classic Agency style. So grab your grande peppermint latte and sing along! ..."it's the most wonderful time of the year". Agency Singer to appear in new Robert Redford movie "The Company You Keep". Based on the novel by Neil Gordon the movie is a thriller centered on a former Weather Underground activist who goes on the run from a journalist who has discovered his identity. The movie stars Robert Redford, Shai Labeouf, Stanley Tucci, Susan Sarandon, Nick Nolte and many more. Look for our very own Allison Riley playing a Newswoman doing a live report. The Agents will perform two sets. The first set is a tribute to classic Hollywood with songs from the 1930's and 40's. The second is an "unplugged" pop set with covers from artists like Lady GaGa, Rihanna and Cee Lo Green all featuring the fabulous band leader, Tom Arntzen. The Kozmik Zoo is known for it's great organic food, cozy atmosphere and live music lounge. It's sure to be a great night! Check out the new Cathrine Hardwick(Twilight) movie Red Riding Hood and watch for the festival scene where you'll easily spot one of our own Agency girls playing the "Singer" in the centre of the town square. We are happy to say our show at J-Louge (1216 Bute) was sold out to a fabulous crowd of enthusiastic music lovers. Thank you for all your support and ardor! Time: Doors are at 7:00pm show starts at 8:15pm. Tickets: $10 at the door. Magique Fashions in South Surrey held a fundraising gala with all proceeds going to the Peace Arch Hospital Foundation. The show was hosted by Fiona Forbes(Urban Rush) and was produced by the talented Viktoria Langton who featured The Agency along with the Source Dancers. The night was a huge success with substantial funds raised! Thank you Vancouver for throwing an incredible party! The 2010 Winter Olympics were over all too soon. We had an amazing time and made lasting memories with people from around the globe. Our biggest memory? Two of us Agents performed in the Closing Ceremonies with Michael Bublé singing "The Maple Leaf Forever". It was a great experience! To Book The Agency for your event just send us a message through Contact and one of us Agents will get right back to you. Got a song request? Send us a message and let us know what song you'd like to hear us sing at your event. "We've worked with The Agency many times because each and every time they bring an amazing show full of gorgeous harmonies and exquisite choreography. I recommend them fully!" 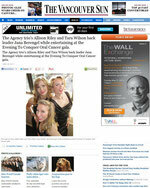 "The girls had nice harmonies, were adorable and added some great choreographed elements which the client appreciated. They were a pleasure to work with."